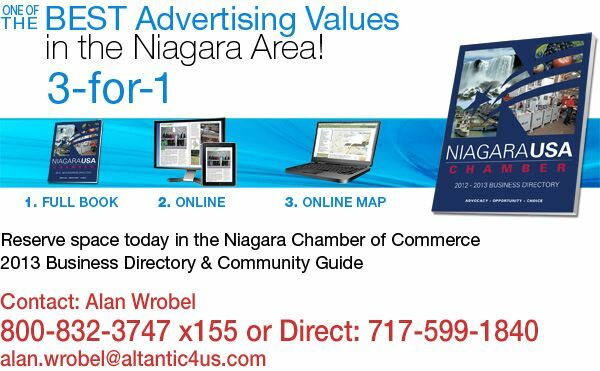 Niagara USA Chamber | Best Advertising Values in the Niagara Area! Best Advertising Values in the Niagara Area! Don’t miss this opportunity to promote your services and products 3 ways, all year, in the Niagara USA Chamber’s new, full color, glossy 2013 Business Directory & Community Guide. Published in print and online with a companion business locator map. Print distribution includes newcomers, visitors, Chamber members, hotels and various high traffic locations around town. The Guides will also be on display at the Chamber office for visitors seeking area information. Plus, the online version and map will be posted at the Chamber’s website for a full year. A limited number of preferred advertising spaces are available. Contact Alan Wrobel, 800-832-3747 x155 or Direct: 717-599-1840, or email: alan [dot] wrobel [at] atlantic4us [dot] com.